Item number A4147 a-i from the MOA: University of British Columbia. 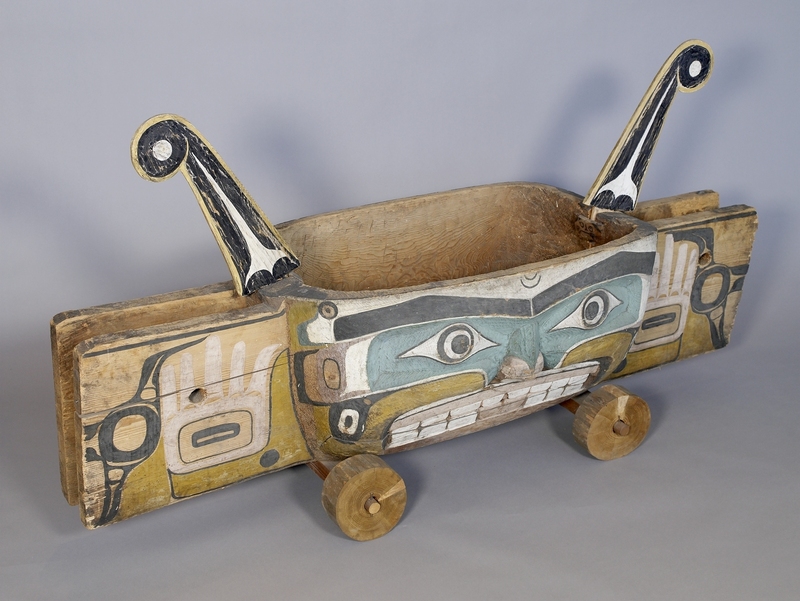 Wooden feast dish (parts a-i) consisting of three large, deeply carved bowls (parts a-c) mounted on wheels, and loosely joined by mortise and tenon arrangements, the whole forming a supernatural creature called a sisiutl. The two end bowls (parts a and c) depict the head and body of the serpent with a large protruding snout, carved eyes, ears and bared teeth. The middle bowl (part b) has a carved and painted human-like face with two hands on the joins. Two large ladles (parts d-e) project outwards like tongues, one from each mouth of the sisiutl, held in by their handles. 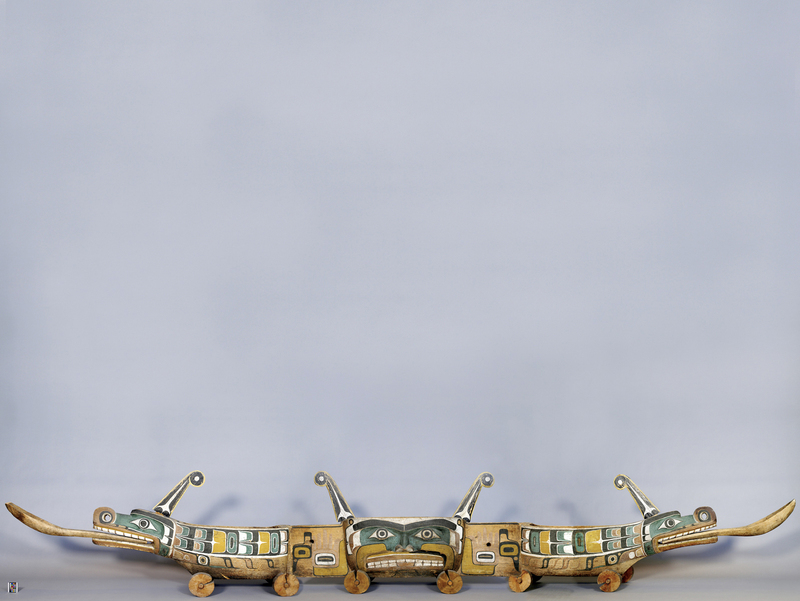 On top of the sisiutl’s two heads are horn-like protrusions (parts f-i). 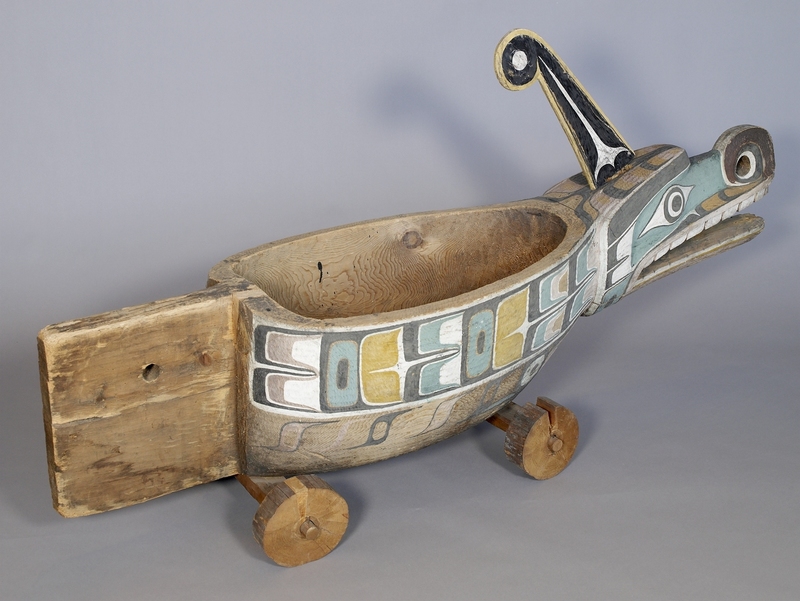 The bowl is painted black, white, green, red and yellow with Northwest Coast stylized designs. 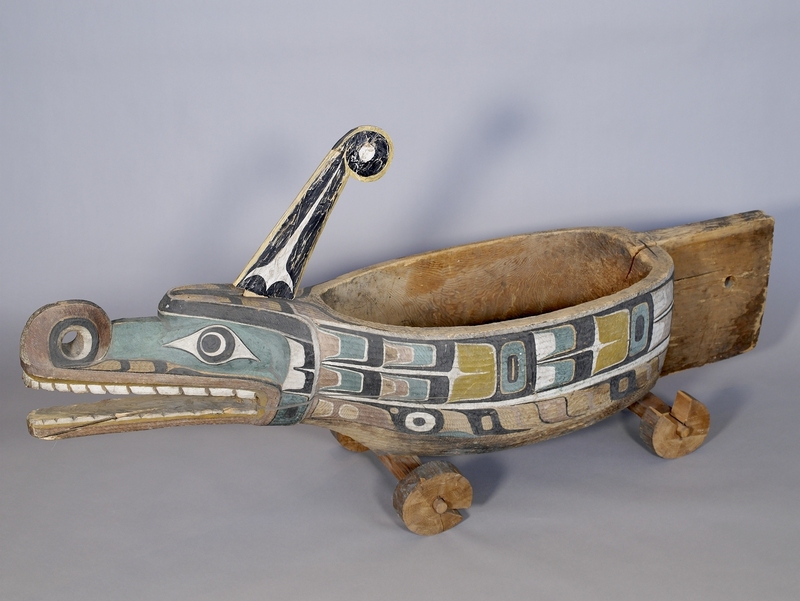 Large feast dishes were used primarily to hold food served to guests at winter dance ceremonies and potlatches, as well as on other important social occasions. They also were symbols of wealth and prestige. The figures represented on feast dishes were family crests and privileges. Important feast dishes were named. Sisiutl is a supernatural serpent, often represented with two heads, and associated with wealth and power. Charlie James made this for Peter Smith (SEwidanaquilla), a Tlawitsas chief from Kalokwis village, in 1907. A document regarding a replica (561/1 a-y) made of this dish states that the original was previously owned by Peter's father, Sewid Smith. This dish privilege was shown at a potlatch hosted by Alex Smith, Peter Smith's nephew. Peter insists that in his time, nothing other than sugar was ever served from it.